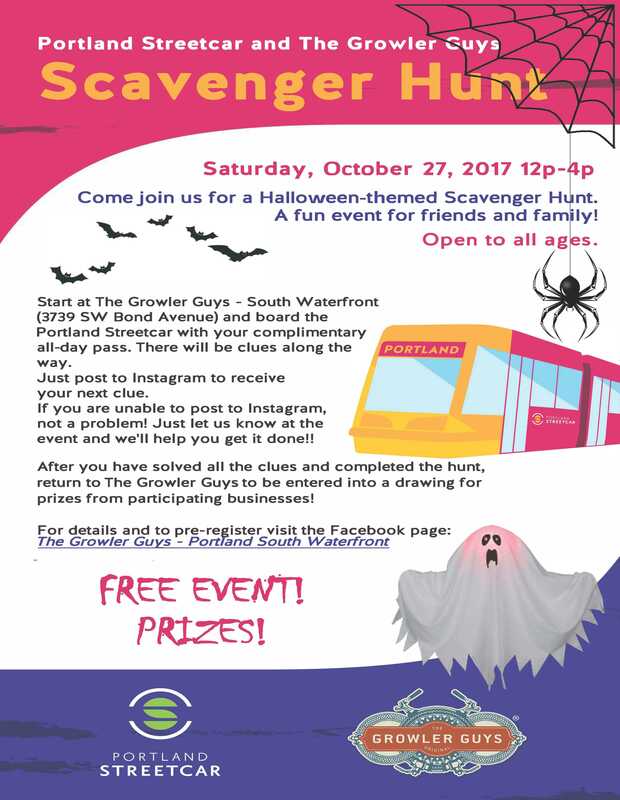 Come join us for our 3rd Scavenger Hunt with The Growler Guys-South Waterfront! The Halloween-themed hunt will be held on Saturday, October 27th from 12:00-4:00. A fun event for friends and family! You will start at the South Waterfront Growler Guys and board Portland Streetcar with your complimentary all-day pass. There will be clues along the way. Just post to Instagram to receive your next clue. If you are unable to post to Instagram, not a problem! The ’Hunt’ goes from the Bond/Lane Streetcar stop up to the Pearl District and back to The Growler Guys. It starts at noon and goes until 4:00. However, you probably want to start before 1:00 to make sure you are back by 4:00 to be entered into the drawing for some amazing prizes! Be creative and have fun, as there is also a prize for the best costume! It's not a race so enjoy your all-day pass on the streetcar and feel free to play around the city for a bit. $1,000 in prizes from participating businesses! You may also register on site the day of the event. If you have any questions, email casey@thegrowlerguys.com. Or call The Grower Guys at 503-208-2523.